Well, it's official. 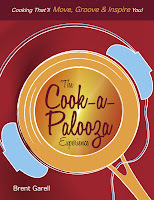 The Cook-a-palooza Experience cookbook has been launched and is ready to move, groove and inspire you in the kitchen. Thanks to everyone who attended the book launch event...I hope you all enjoy the book! Cook-on!